September 30 of each year is International Translation Day. This year, we are celebrating International Translation Day with ten themes highlighting this industry. Some will be funny, others heartwarming— we hope to generate discussion about a field focused on being undetectable, and interest even non-translators and interpreters to join the conversation. 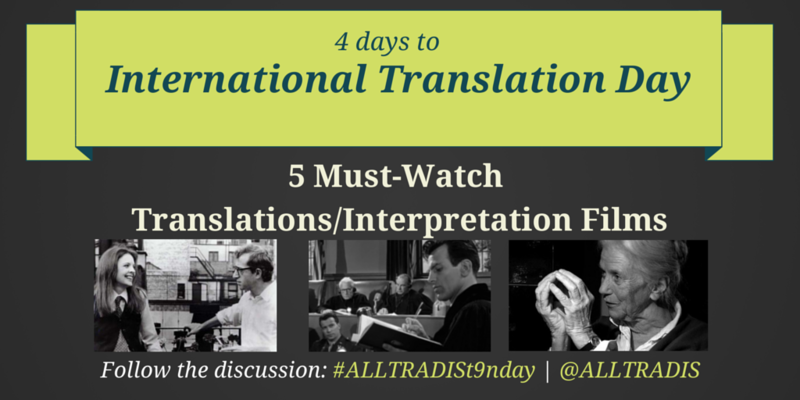 You can follow our updates on Twitter @ALLTRADIS or follow our discussion by following #ALLTRADISt9nDay. Many know, some love, but all sympathize with the famous scene from Sofia Coppola’s film, Lost in Translation. This film is the most notable movie about the industry, and this film, is the most prominent line in the film. Although it’s a very brief moment, it accurately depicts the important role quality translation and interpretation has. Of course, life of most interpreters is not nearly dramatic as one portrayed by Nicole Kidman. However, this film does an excellent job portraying the important role interpreters play at international reunions. The movie was also filed inside the U.N. General Assembly and Security Council, with special permission from then-Secretary General, Kofi Annan. This film is actually based on the Nuremberg Trials of 1945. The Trials are historically important for interpreters, as it was where simultaneous translation was debuted. Simultaneous interpretation is an essential technique for international reunions, conferences, and still in trials. Since its debut, simultaneous interpretation has become much quicker, smoother, and regulated process. Nonetheless, it’s very interesting to see how it all started. Svetkaba Geier is an acclaimed Russian to German translator, responsible for introducing Fyodor Dostoyevsky’s literary works to non-Russian audience. This biopic explores Geier’s eventful and fascinating life, which has seen the frightening regimes of Stalin and Hitler. She skillfully and meticulously transforms the same language that spoke hatred and fear during those destructive years, and turns them into beautiful and enlightening literary masterpieces. The fictional story a Cold War nuclear crisis captures the tensions between Soviet Union and United States. It depicts the sensitivity of language and stress interpreters face at time of diplomatic or political crisis. Of course, it is also an excellent film portraying the vital role interpreters play in international, multicultural, multilingual situations. This is my personal favourite, although I may be cheating, since it doesn’t exactly follow suit of translation and interpretation in the traditional sense. Woody Allen’s classic presents how even speakers of the same language sometimes don’t truly understand each other through communicating via thought subtitles. If you watch the scene without any sound, you get a completely different interpretation of the scene, as if you listen without watching the screen. It also hints at the important role translators and subtitlers have in our basic cinematic experience. Imagine, what would happen if all subtitlers decided to slack on their jobs!